Aloha. The Hawaii Republican Assembly periodically shares important information about policy and politics with Republicans and conservatives in the Aloha State. Here is our latest "Code Blue" e-newsletter. Matson is increasing its already high shipping rates yet again. We hear this same story so frequently that even those who truly understand the story and the related scam have become numb to its impact. Everyone knows that Hawaii consumers pay the highest prices in the country. $3,000+ is the estimated cost per family in higher prices for letting Matson run its virtual monopoly racket in the shipping market to/from Hawaii. 95% of our goods must be imported . . . and most of that comes to Hawaii in Matson containers on Matson ships. 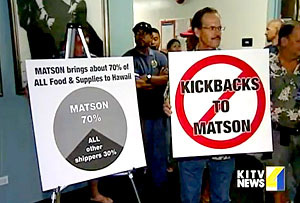 Matson also charges TEN TIMES more than the private company’s global competitors that are prohibited from doing business in Hawaii. What could your family do with $3,000 more to spend each year (or $225,000 over 75 years)? HERE’S THE SCAM: Hawaii's Democrat politicians deliberately increase the price of everything through a little known law known as The Jones Act, which is an out-dated, protectionist law from the early 20th century that prohibits global shipping competition. This causes artificially high prices because the entire cost of the inflated shipping is passed on to the consumer in the final price tag of all goods and services. Now, you would think that the hardworking, overtaxed and overcharged people of Hawaii deserve the absolute lowest prices on goods and services through vibrant global competition. However, Democrat politicians believe otherwise, and Matson wants to keep it that way. They use the Jones Act as an excuse to cover their price-fixing conspiracy. This forces Hawaii consumers into paying billions of dollars in higher prices. HIRA’S position is quite simple . . . and the platform position taken by HRP and its candidates should be the same: We need to combat the artificially high prices that result from Hawaii’s price inflating, job-killing, family-squeezing shipping monopoly. We will work to obtain a temporary exemption until the Federal government establishes a free trade zone across the entire state. Obtaining a permanent exemption from the Jones Act for Hawaii will authorize shipping companies from around the world to compete in serving the people of our islands; thereby lowering the cost of imported goods to local consumers and business. 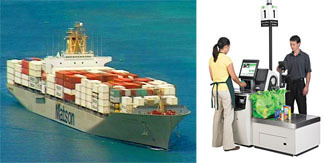 This new competition in shipping will remedy Hawaii’s massive trade deficit by making competitive options available to Hawaii’s manufacturers and exporters; thus generating new jobs and industries related to global trade. Hawaii can affordably compete in the global economy by manufacturing and exporting something other than our garbage (Hawaii’s #1 export to the world). If you do not believe there is a conspiracy against Hawaii consumers, then take it from Matthew J. Cox, the president and CEO of Matson, Inc. His e-mail HERE to every employee of Matson urging them to donate to pro-Jones Act Democrat politicians and to Matson’s political PAC in order to protect Matson’s existing shipping monopoly should be required reading for every resident of Hawaii. In this one-page e-mail, which is accompanied by a form authorizing payroll deductions by Matson employees for the company’s political slush fund, Mr. Cox explains exactly how the scam works. Cox even explains how great it is that these politicians let Matson perform its repair of ships in China. That’s right, CHINA. First, help others to understand that Hawaii Democrats will never take steps to fix this problem. Democrats benefit financially from Matson and Matson benefits financially from Democrats who keep the Jones Act alive. Second, insist that the Hawaii Republican Party and its candidates at every level of government take the right public stand on this issue in each and every election. Third, insist that Hawaii Republicans and the party organization continue to pound the Democrats until the GOP has a majority to fix this issue. Fourth, educate everyone you come in contact with. Download HIRA’s flyer HERE and make copies for (or share it online with) your friends, neighbors, relatives, coworkers and strangers. 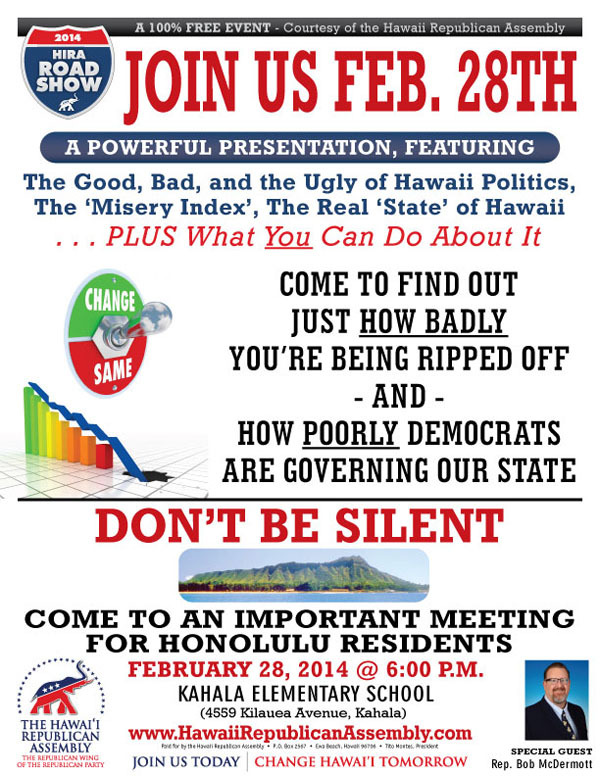 Fifth, come to HIRA’s next "Road Show" (and invite your friends, family and coworkers to this free event) to learn about the devastating effects of 60 Years of Harmful Policies from Hawaii’s Ruling Democrat Party and what you can do. THIS IS A GIGANTIC ISSUE THAT AFFECTS EVERYBODY’S STANDARD OF LIVING, QUALITY OF LIFE, AND COST OF LIVING. TAKE STEPS ONE THROUGH FIVE ABOVE, AND THE ARTIFICIALLY INCREASED PRICE OF PARADISE WILL BE A LOT LOWER. 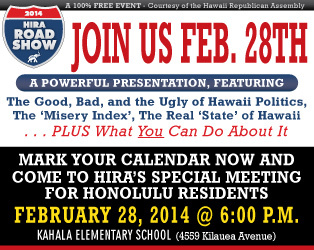 Finally, HIRA needs your help to keep fighting the ruling Democrats who control Hawaii. Educating the public is key . . . and costly. Please support “HIRA Action” with your generous contribution today. With your help, we can give every family in Hawaii a $3,000 per year raise by putting an end to this corruption. P.S. Please click "Forward email" near the bottom of this message in order to easily share this e-mail with friends and family, neighbors and co-workers. for conservative solutions in the islands. Please visit us at www.HawaiiRepublicanAssembly.com. and an affiliated chapter of the National Federation of Republican Assemblies.